Looking to accessorize your crowd control layout? 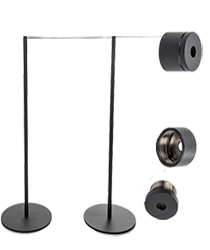 These stanchion signs and accessories are a great way to convey messages to people checking in or waiting to be serviced. 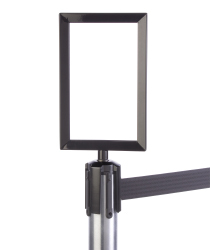 Post topping frames can hold one of our many crowd control post signage inserts. 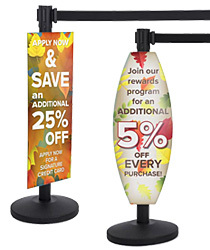 With these stanchion signs and accessories, not only will customers know where to form a line, but they can also get information about estimated wait-times and where to stop until they are called upon by the next available employee. 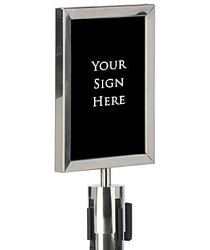 Sign holders can also be used to sell advertising space. Customers in line are guaranteed to walk buy these signs, so the ad will make lots of impressions! Our large selection of inserts can accommodate any restaurant, retail store or service organization. 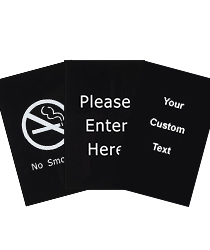 We offer a number of displays with pre-printed messages in addition to displays with custom imprinting. Also available here are dollies and carts. 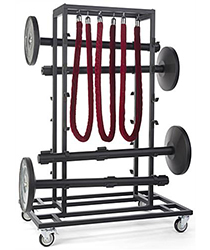 Get the equipment needed to easily transport stanchions around to a new location! Our large models can hold multiple stanchions while dollies are great to move one post at a time. Equip your business so you can efficiently move, rearrange and store stanchions when not in use.